In April 2015, the Arab Region Parliamentarians Against Corruption (ARPAC) regional chapter received a grant from the National Endowment for Democracy (NED) which has been utilised to finance the â€œStrengthening Anti-Corruption Policies and Mechanismsâ€ project, focusing on the Middle East and North Africa (MENA) region. Through the generous support of NED, ARPAC has since sought to develop national anti-corruption reports specific to seven MENA region countries: Bahrain, Jordan, Kuwait, Morocco, Palestine, Tunisia, and Yemen. November 2015), and Palestine (11 January 2016) in order to hold conversations regarding the National-Level Reports created by selected researchers. Among the attendees of these roundtables were MPs, civil society organisations, academics, members of the media, regional and international organisations, government officials, as well as representatives of the judiciary. The analyses and recommendations that emerged from these roundtables were included in the final version of the National-Level Reports to reflect views of the aforementioned stakeholders. The final regional report is expected to be released in spring 2016. 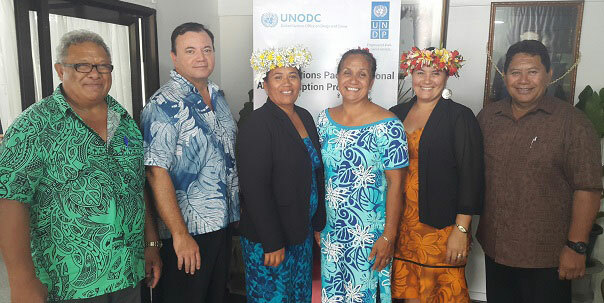 On 19 and 20 January, GOPAC Oceania, along with the UN Pacific Regional Anti-Corruption (UN-PRAC) project, an initiative of the United Nations Development Programme (UNDP) and the United Nations Office on Drugs and Crime (UNODC), held a capacity-building workshop for Cooks Islands parliamentarians to improve on good governance practices and encourage greater engagement with the UN Convention Against Corruption (UNCAC), which was ratified in 2011. The two-day workshop was led by GOPAC Oceania Chair John Hyde and UNODC Anti-Corruption Pacific Regional Advisor Annika Wythes, and attended by the majority of the countryâ€™s parliamentarians. Among the attendees were GOPAC Cook Islands Chair and Minister of Health Honourable Nandie Glassie, Deputy Prime Minister Teariki Heather, Speaker of Parliament Niki Rattle, Leader of the Opposition William Heather, as well as several ministers and GOPAC members. The workshop addressed the crucial role of parliamentarians in ensuring that public spending is done in a way that promotes openness and transparency, particularly in the natural resources sector which is plagued with corrupt practices in Pacific Island States. The MPs present also brought to the agenda the lack of women in decision-making positions, given that female representation in Parliament sits at 12.5 per cent. Speaker Niki Rattle stated that she intends on holding discussions with Prime Minister Henry Puna and members of all political parties regarding this very topic. GOPAC is thankful for the support of the Australian International Development Agency (AusAID) for the UN-PRAC project, which is carrying-out integrity-focused activities in 15 nations in the Pacific. (Secretary), Tai Tura (Treasurer), as well as members Selina Napa and Rose Brown. Members of the chapter adopted their Action Plan, where they indicate their intention to participate in the Cook Islandsâ€™ national anti-corruption strategy process, launch the countryâ€™s parliamentary code of conduct, and foster engagement with civil society organisations, among other commitments. GOPAC Anti-Money Laundering Global Task Force (GTF-AML) member Hon Roy Cullen, P.C, C.A. recently delivered a presentation on how Canada has been and continues to be an ardent supporter of the anti-corruption movement, both on a national and international basis. The event was hosted by the Canadian Club of Victoria and held in Victoria, British Columbia, Canada. Extractive Sector Transparency Measures Act, 2014 as among important elements of the countryâ€™s anti-corruption programme. Before taking questions from audience members, Hon Cullen encouraged all to urge the government to emulate the efforts of the United Kingdom with respect to the creation of a publicly-accessible registry of beneficial owners of companies operating within the country. He also pressed those present to contact their political representatives to let them know that Canada should actively support and promote the prosecution of grand corruption as a crime of international law. Akaash Maharaj, GOPACâ€™s Chief Executive Officer recently wrote an article on the North Atlantic Treaty Organizationâ€™s (NATO) intervention in Afghanistan, the current crisis in Syria and Iraq, and the November 2015 Paris attacks. We invite you to read his contribution and leave a comment below the article.